Never run a Google Adwords campaign before? Here are the key high-level concepts you need to ensure you get the most valuable traffic for the least money. 1. Running Google Ads Comes Later. First…. Before you run a campaign, you need to get your site, and business strategy, in order. Ask yourself: “when I get traffic, what do I want this traffic to do”? This is known as the “desired action” or “conversion”. The desired action you want a visitor to take when they land on your page. The desired action might be to sign up to a newsletter, bookmark the site, or make a purchase. Next, ensure your landing pages are written in such a way as to lead people to take that desired action. Is it crystal clear what visitors need to do? A good way of testing this is to look over the shoulder of someone who is new to your site. Watch what they actually do, as opposed to what you expect them to do. We’ll look at testing in step five, but for now, do some basic testing to make sure everything is as clear as it can possibly be. If it’s not clear what people have to do, you’ll lose a lot of money on the click-backs. 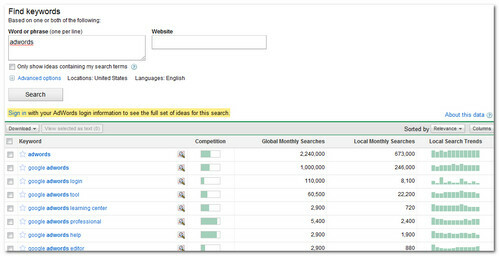 Google include a keyword research tool in Adwords. Sign up to Adwords, and you’ll be prompted to enter a couple of phrases, which will generate keyword lists. You then ads the keyword terms you like best to a master list. However, this isn’t the only way to get keywords. Keep in mind that Google will often direct you towards keywords it wants you to bid on. What works well for Google may not work well for you. So also try out alternative keyword tools that use different keyword databases. We offer a free keyword research tool powered by Wordtracker. Also visit Facebook, forums and blogs related to your topic, and look at the keyword titles people use. What language do people use? What terminology do people use? It is likely they will use the same terminology when conducting searches. You can even use Google to help surface these concepts in real-time using their discussions filter & sorting by date. Whilst keyword lists can become potentially huge, it’s best, when starting, to cut these down to a manageable size, as it makes it much easier to manage and test campaigns. Group closely related keywords together in individual groups, and direct traffic to an appropriate page on your web site directly related to these keyword terms. The page should include these terms in the body text and headings. Once you see what is working, and what isn’t, you can scale up in the appropriate areas, and stop advertising on the keywords that don’t work. If you look at a search results page, you’ll see ten listings, or more, down the center-left of the screen. Eight or more Google ads appear down the right hand side. The searcher could click on any one of those listings, although they mainly click on the results closest to the top. Check out this heat map analysis to give you an idea of clicking patterns. To grab attention in all this clutter, your ad needs to stand out. Examine your competitors ads. Are they all similar? Can you twist their approach into something new and fresh? Hint: the Adwords listings that appear highest up the list, on a regular basis, tend to also have the highest click-through rates. This means they have the highest appeal to the audience. Mimick their approach – as it has likely proven more successful than those lower down – but add something new to your ad text, in order to stand out. What is the best thing about your service? What can you do that others can’t? Perhaps you have lower prices. Perhaps you operate in a location close to prospective buyers. Perhaps you give away free samples. Whatever your edge, specify it in your ad text. Write eye catching headlines. Try to avoid weak, descriptive terminology, such as “Parts Supplier”. Instead, try “Sale On Acme Parts”. Be specific about the benefits you offer. There is a lot of experimentation involved, but what’s good about Adwords is that the ads are very easy to change if something isn’t quite working right. Many people blow through a lot of money and have nothing to show for it. Only you know how much you can spend trying to acquire a customer, so make sure you know this information going in. Daily budget – set the maximum amount you want to spend per day on clicks. CPC – how much you want to pay for each click. Ad Quality – This essentially means “relevance”. Make sure your keyword, your ad text and landing page text are aligned i.e if the searcher searches for “used car parts”, your ad mentions “used car parts”, as does you landing page. If this terminology differs to a significant margin, it forces up the price of your clicks. Get the quality score right, however, and you can outrank other bidders who are bidding more than you. They may not be as relevant to the search query. For more on the quality score, have a read of “Google Quality Score Factors“. Few PPC campaigns work like a charm on first attempt. Are your ads running? Look out for warning messages in the Adwords control panel. Some of your ads may be disabled, for a variety of reasons. Use the inbuilt keywords diagnostics tool to help you. How often are your ads being displayed? You may have to adjust bidding and scheduling to get your ads to show more often. Are visitors doing what you want them to do on your site? Make sure enough people are moving through to desired action, else your money is wasted. Test different landing pages, ad text and offers to increase the conversion rate. Also check out this free online book, Conversion For Dummies. When you’re ready to learn all the advanced tricks of the trade, check out our PPC training course. What a great primer for new advertisers! Its amazing how many small businesses get into Google advertising without the fundamental steps, and you put everything in the right order here. Good post. It’s all a circle really – once you’ve got some stats to work with it’s back to step 1! I’ve been learning heaps about ppc recently and its the keyword matching options and negative matches that are still causing me a little confusion but I guess as long as you track and refine constantly you should do well ultimately. thank you for this. 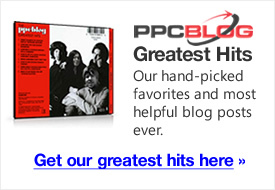 Great hints for people that start PPC. its so important to make sure you are spending your money wisely to attract the customers you are looking for.